There has already been more than enough written about Edward Snowden and his revelations about the U.S. government’s secret surveillance program PRISM. I will not go into the details about the PRISM program, nor whether it compromises individual civil liberties or is simply trying to gather intelligence information to protect America from harm. I will simply say that I do NOT see it as a threat to American individual civil liberties, and I see it as a necessary means to gather intelligence on what America’s enemies might do to harm and kill Americans in the United States or around the world. 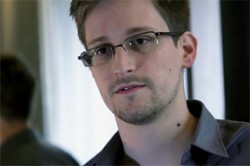 I also believe that Edward Snowden is a traitor with no real regards for his country. Beyond that, one thing about the PRISM program I do find troubling is what it is not doing. The fact that this was supposed to be a secret program demonstrates very clearly to me that this was not supposed to be for the general American public. It shows that as much as 90 percent of all PRISM surveillance is with Muslim countries or countries where possible Al Qaeda or Taliban activities may be taking place. At the top of the list for countries under most surveillance in the PRISM program is Iran. This is followed by Pakistan, and then Jordan and then Egypt and lastly India (simply because of the number of radical Muslim extremist groups that have been found in that country and its close proximity to Pakistan). Not on the radar at all it seems are two countries that do aim missiles at us—China and North Korea. What is so surprising is that the United States does not seem to be as concerned or as interested in what espionage activities China and North Korea might be doing in the United States or around the world. China is a rival superpower and an economic competitor of the United States. North Korea is an outright enemy of the United States and its allies in Asia. We have to keep in mind that both China and North Korea have large espionage networks in the United States, and Lord knows what activities they are carrying out. If conflict were to break out between the United States and North Korea, what could North Korea’s espionage network in America do? These are only some of the questions that have yet to be asked, and more important what harm can come of these espionage networks to ordinary Americans? In my view, it does not matter how good the PRISM surveillance program may be, it is only as good or as flawed as those who created it and are using it. For the Washington, D.C. bureaucrats to not consider what may be possible in this world of ours, it seems that the U.S. government is operating with a one tract mind. Knowing something about American history, this sadly is not new.